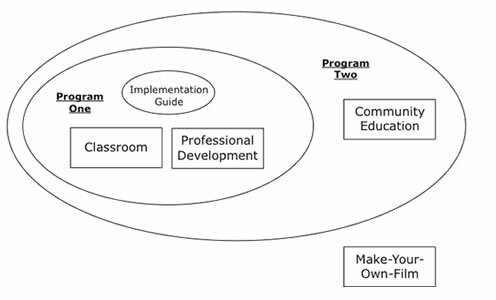 This basic Program bundles the Classroom Resource with the Professional Development Resource – which includes an Implementation Guide. This broader Program expands Program One to include the Community Education Resource. The Implementation Guide included with the Professional Development Resource outlines the use of the additional resource. The Make-Your-Own-Film Resource can be used as a stand-alone; in conjunction with Program One or Program Two; or as a supplement to the Classroom Resource.